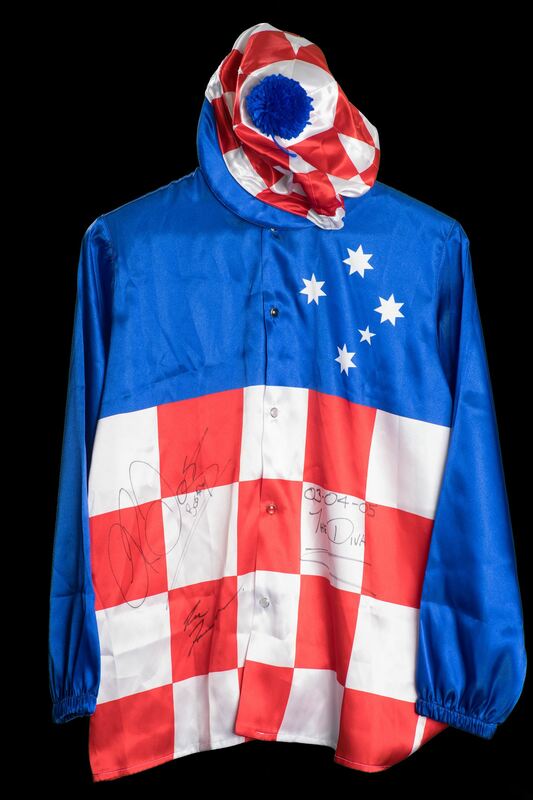 These silks have been generously donated and are being offered to help raise funds for BlazeAid to support farmers in North Queensland who have recently been devastated by major floods. BlazeAid is a volunteer-based organisation that works with families and individuals in rural Australia after natural disasters such as fires and floods. Working alongside the rural families, our volunteers help to rebuild fences and other structures that have been damaged or destroyed. BlazeAid is a registered Charity with PBI Status. A Public Benevolent Institution (PBI) is a type of charity which has a predominant (main) purpose of relieving needs arising from conditions such as poverty, sickness, distress or helplessness. This is known as providing ‘benevolent relief’. DESERT KING (IRE) (1994). 5 wins-2 at 2, Irish Derby, Gr.1. Sire of 1178 rnrs, 659 wnrs, 27 SW, inc. Makybe Diva (VRC Melbourne Cup, Gr.1), Desert War, Mr Dinos, Darsalam, Chelsea Rose, etc. Sire of the dams of SW Kew Gardens, Eagle Falls, Bocca Baciata, Mango Diva, Olorda, Fabrizio, Kalsa, Thawaany, Mahara, Real Stolle, Topeka, Prima Luce, Bloomfield, Hebah, Rosay, Thank You Bye Bye, North Mum, Valonia, Easy Game, Faithfilly, Hillbilly Boy, etc. MAKYBE DIVA (f by Desert King (Ire)). 15 wins. See below. MUSKET (c by Redoute's Choice). 4 wins from 1200m to 1600m, A$308,250, STC Shannon S., Gr.2, AJC Wales Truck Repairs Welter H., National Jockeys Celebration Day H., STC Spring Carnival H., 2d AJC Japan Racing Association P., L, STC Royal Parma S., L, Sky High S., L, 3d STC Fairfield RSL H., Furniture One Group H., 4th Newcastle JC Newmarket H., Gr.3. Sire. WONDER KID - JOLLY BANNER (H.K.) (g Lonhro) 7 wins to 1400m, A$22,000, HK$10,485,200, to 2018-19, HKJC Bauhinia Sprint Trophy H., Gr.3, Kwangtung Cup, MRC (Mornington) Toronado at Swettenham P., HKJC La Colline H., Chevalier Senior Housing H., Tin Shui Wai H., Hopeful Future for Youth H., 2d HKJC Chinese New Year Cup, Lion City H., Beas River H., HKU JC Student Villages H., 3d HKJC Oriental Watch Sha Tin Trophy, Gr.2, Flamingo Flower H., Sha Tin Mile Trophy H., Kwangtung Cup, Tolo Harbour H., 4th HKJC Premier Cup, Gr.3. C'EST BEAU LA VIE (f Bernardini (USA)) 5 wins from 1000m to 1600m, A$244,100, SAJC Laelia S., L, Holdfast Insurance H., Schweppes P., Oakbank RC Harcourt Adelaide Hills H., 2d SAJC Schweppervescence S., Gr.3, Graeme Conron H., Book Your Event at Morphettville 2YO H., 3d SAJC Schweppes Oaks, Gr.1, 4th MVRC WH Stocks S., Gr.2, SAJC Hill Smith S., L.
WALES (c Redoute's Choice) 4 wins-1 at 2-from 1200m to 2050m, A$217,110, MRC Redoute's Choice S., L, MVRC Campolina H., MRC Catanach's Jewellers H., 2d Ballarat Cup, L, MVRC World Racing Tours H., 3d MRC Le Pine Funerals H.
Compass. 3 wins at 1300m, 1900m, ATC Onemorenomore at Vinery H., 2d ATC WED Group H., MVRC Sportingbet H., MRC Schweppes H.
Kentucky Diva. 2 wins at 1600m, 2100m to 2018-19, MRC Le Pine Funerals H.
LA AMISTAD (f by Redoute's Choice). 6 wins from 2100m to 3200m, A$337,240, ATC WJ McKell Cup, L, VRC Andrew Ramsden S., L, ATC Pro-Ride H., 2d ATC City Tattersalls Club Cup, L, 3d VRC Lexus S., Gr.3, Hawkesbury RC Rowley Mile H., L, 4th ATC Hill S., Gr.2. Shadowofexcellence (g by Redoute's Choice). 3 wins from 1400m to 2100m, 3d VRC Super Impose S., L.
Rodway (g by Street Cry (Ire)). 3 wins at 1600m, 2050m, A$80,985, MVRC Sportingbet William Hill H., 2d VRC Bitalli H., MRC (Mornington) Bayside Automotive Group H.
Bakarje Diva (f by Redoute's Choice). Placed, 2d SAJC Advantage SA P., 3d SAJC Tattsbet P.
Celtic Rush. 2 wins at 1100m, 1300m in Aust. Berkshire Babe (f Desert King (Ire)) Winner at 1700m in 2017-18 in Aust. Excursions. Winner at 1500m in Aust. Believe (f Fastnet Rock) 2 wins at 1300m, 1500m, A$176,975, ATC Staff Recognition Day H., 3d Australian Oaks, Gr.1, ATC Phar Lap S., Gr.2. Rinjani (c Choisir) 2 wins at 1400m, 1600m, R175,102, 2d Fairview East Cape Guineas, L.
Dream Diamond. 3 wins from 1400m to 2150m in Aust. Yoshino Daio. 4 wins from 1200m to 1600m in Japan. Mireille. 4 wins-1 at 2-at 1200m, 1400m in Japan. Happy Day. 4 wins-1 at 2-to 1400m in Japan. Creel. 2 wins at 6f in U.S.A.
Cross Question. 2 wins at 9f, 1¼m in GB. Producer. Race Record: Australian Horse of the Year twice. Champion stayer in Australia in 2003-04 & 2005-06. Champion middle distance horse in Australia in 2005-06. Head of The 2005-06 Australasian 4YO+ Classification. 15 wins from 1400m to 3200m, A$14,526,685, VRC Melbourne Cup, Gr.1-3 times, MVRC WS Cox P., Gr.1, STC BMW S., Gr.1, VRC Australian Cup, Gr.1, 2000m-in track record time, AJC Sydney Cup, Gr.1, VRC Turnbull S., Gr.2, Queen Elizabeth S., Gr.2, MRC Memsie S., Gr.2, Werribee Cup, L, VRC Jezabeel H., 2d MRC Caulfield Cup, Gr.1, MVRC John F Feehan S., Gr.2-twice, MRC St George S., Gr.2, 3d STC BMW S., Gr.1, Ranvet Rawson S., Gr.1, MRC TS Carlyon Cup, Gr.3, 4th MRC Caulfield Cup, Gr.1, VRC Turnbull S., Gr.2, MRC Memsie S., Gr.2, MVRC WH Stocks S., Gr.3. Produce Record: Dam of 8 named foals, 6 to race, 4 winners. 2007 Rockstardom (g by Galileo (Ire)). 2 wins at 1600m, 2050m in Aust. Touch of Mink (f Not a Single Doubt) 2 wins at 1400m, 1600m, A$172,310, in 2017-18, ATC Supporterhub H., 2d ATC Owners H., Casino Prince at Vinery H., 3d Moonee Valley Fillies Classic, Gr.2, ATC Owners Benefits Card H., Half Yearly Membership H., Tab.com.au H.
2009 Coaster (c by Encosta de Lago). Unplaced. 2011 Taqneen (g by Lonhro). 2 wins at 1600m in Aust. 2012 Surrey (g by High Chaparral (Ire)). Winner at 1600m in 2017-18, 2d Waikato RC Mid-Winter Christmas Lunch 7 July H., Seafood Bazaar H.
2014 Divanation (f by All Too Hard). 2 wins at 1650m, 1750m to 2018-19, 2d SAJC Sepoy at Darley H., 3d MVRC Gallagher Bassett H.
2015 Demand Attention (f by Starspangledbanner). Unraced. 2016 Sublime Diva (f by Brazen Beau). Unraced. 2018 (f by Written Tycoon). Missed in 2010, 2013; not served in 2016. Served by More Than Ready. Date of last service, 29.11.2018. 05/Apr/2003 8th of 15 MRC Programmed Maintenance Anniversary Vase, A$100,500, 1400m, time 1:22.52. Track good. Carried 55.50kg. Karamazou was 1st and North Boy 2nd and Desert Sky 3rd. 25/Apr/2003 6th of 11 VRC Auckland Racing Club H., L, A$76,000, 1600m, time 1:37.10. Track dead. Carried 56.50kg. Old Man was 1st and Marbine 2nd and Special Scene 3rd. 08/Mar/2004 6th of 10 VRC Australian Cup, Gr.1, A$1,005,000, 2000m, time 2:1.67. Track good. Carried 55.50kg. Lonhro was 1st and Delzao 2nd and Elvstroem 3rd. 02/Oct/2004 7th of 16 VRC Turnbull S., Gr.2, A$501,500, 2000m, time 2:0.46. Track good. Carried 56.50kg. Elvstroem was 1st and Mummify 2nd and Confectioner 3rd. 12/Feb/2005 7th of 15 MRC CF Orr S., Gr.1, A$302,000, 1400m, time 1:22.85. Track dead. Carried 55.50kg. Elvstroem was 1st and Savabeel 2nd and Lad of the Manor 3rd. (1 1/2) Nakayama April S., L, 46,050,000¥, 2000m, time 2:00.1. Track firm, Weather Fine. Carried 59.00kg. Suzuno March was 1st and Hustler 2nd and Kanahara Dragon 3rd. Trainer: L.Freedman. Owner: Emily Krstina (Aust) Pty Ltd. Jockey: GLEN BOSS. (NK) Kyoto Tenno Sho (Spring), L, 256,960,000¥, 3200m, time 3:16.5. Track firm, Weather Rainy. Carried 56.00kg. Suzuka Mambo was 1st and Big Gold 2nd and Eye Popper 3rd. Trainer: L.Freedman. Owner: Emily Krstina (Aust) Pty Ltd. Jockey: GLEN BOSS. Australian Horse of the Year twice. Champion stayer in Australia in 2003-04 & 2005-06. Champion middle distance horse in Australia in 2005-06. Head of The 2005-06 Australasian 4YO+ Classification.